Despite the fact that Farhadi denies any reference to Antonioni’s film, About Elly seemingly has the same very narrative theme of “The Adventure”. Again one of the main characters disappears and for the rest of the film, other characters try to discover the reason of her actions. The difference between The Adventure and About Elly is the fact that Elly, despite her absence remains the main questioning character (not the protagonist) and the part of the story that takes place while she is gone is all about her, reflecting the efforts of the other characters to analyze and consequently understand the actions of an unexpressed character. Differently from The Adventure, there is no relationship redefined. And the characters mainly try to resolve the sudden disappearance of Elly. As the title suggest, the main theme of Lynch’s film is based on the concept of being lost, though this losing oneself is not by any means similar to the above examples. The protagonist changes his face, his relationship with the other characters is changed too. Those characters that reappear repeatedly in various roles and under various circumstances seem to be utterly unaware of the previous incidents. The protagonist in Lost Highway gets lost in the corridor of his very own house. What seems to be Lynch’s narrative intention in this film is alienation of the character, and therefore the spectator, in a situation that normally has to be a familiar atmosphere for him. It seems that New York is one the best places you can get lost in. The fear of facing the unpredictable on an everyday basis is the theme that has been repeated over and over in cinematic narration. 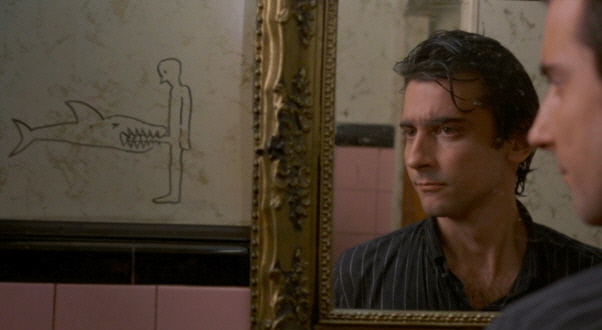 After Hours is an exceptional, odd narration, it’s so similar to a nightmare that after awhile we too, as the protagonist himself, give up trying to make sense of the incidents: it just can’t be real. The film is about a rational mind captured in an irrational situation. The main character, Paul Hackett (played by Griffin Dunne) works as a word processor. The day the story begins he spends some time in a Cafè, reading Tropic of Cancer (Henry Miller) and that is how the conversation between him and a girl Marcy (played by Rosanna Arquette) starts. In After Hours, each coincidence causes the successive one, so though there is an undeniable sense of irrationality in the actions and incidents, they take place in the most fluid way. These accidental facts and encounters return repeatedly during the plot. Again the protagonist is not capable of getting back to his home, as hard as he tries he can not find his way back through Soho, he loses his only twenty dollars in the taxi that drives him down from Manhattan to Soho, the money just flies away “accidentally” through the open window and for the rest of the night the character gets involved in the most absurd, nightmarish incidents. And just as any other nightmare, the story finishes when the night is over. 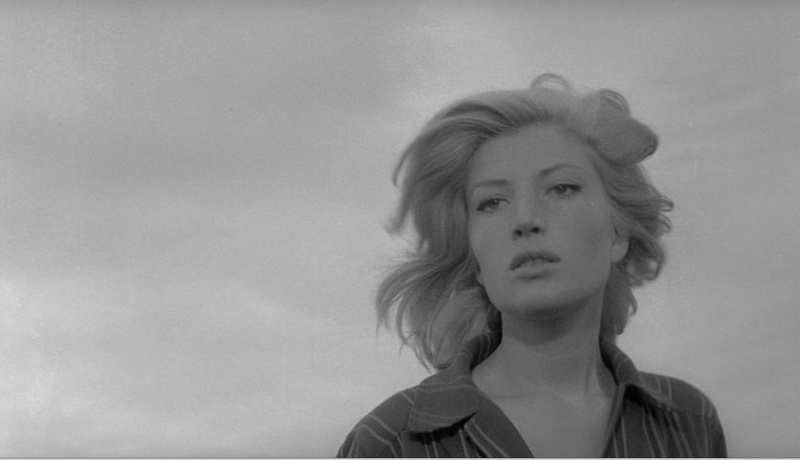 What differs L’avventura from the above mentioned examples is the fact that in Antonioni’s story the spectator doesn’t stay with the lost character, so what the viewer of Antonioni’s film experiences is actually dealing with the emptiness of the already introduced character. So again the filmmaker starts with a proper initial treatment, introducing us a character and defining her relationships with other characters of the film, only to give us the impression of lack of her presence, later. From the moment the character disappears, walking out of the story that seems to be her own very story, the remaining characters pass the whole time reminding her presence and therefore on the basis of the initial treatment, the relation between the characters redefines itself. The exceptional intense initial treatment of the protagonist (Chuck Noland played by Tom Hanks) during the opening sequence gives us enough material to watch a whole cinematic narration with merely one character. After facing the initial representation, we get to know Chuck well enough to know that he is precise and serious in his work, in love with his woman (Kelly played by Helen Hunt) and counting down every single probability, he doesn’t even doubt the fact that the plane is going to land as he planned and exactly where it’s supposed to land. But the story moves forward differently, an unpredicted storm hoists the plane down and leaves the character as the only person who survives the deadly incident. The island, where the character stays for the most part of the film represents the lack of everything we witnessed in the opening and closing sequences. Once again the filmmaker ushers us toward a minimal space, where the protagonist can not foresee a thing, nothing proceeds as he plans. By time he manages to use whatever he has in hand, a piece of stone, packages that he has failed to take to their destinations. He creates a secondary character for his story, drawing Bart Simpson’s face with his wounded hand on a ball, calling him Willson and creates a dramatically effective relation with an object. 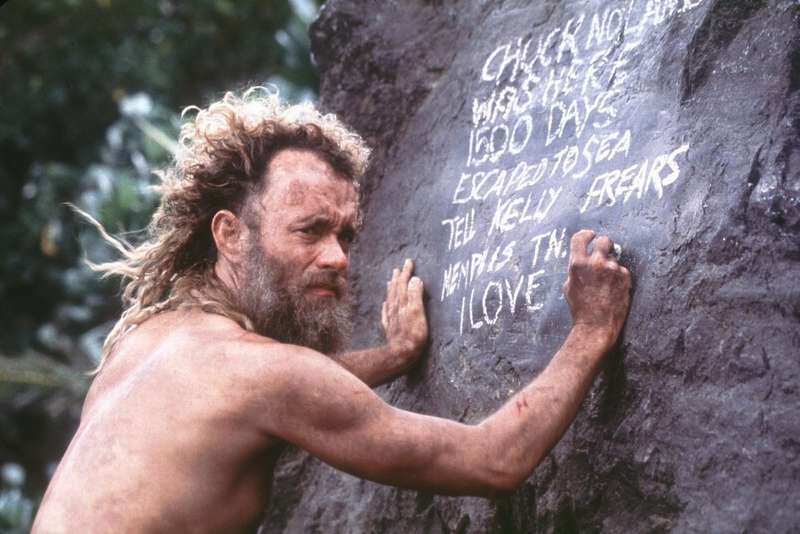 Strangely, Cast Away is not lacking of dramatic elements: one character, a vast unknown ambient and an effective initial treatment of the story is all that Zemeckis needs to narrate a breathtaking story. Every element of a cinematic narration in Gerry tends to be as minimal as it possible can be. The whole exchanged dialogues of the film can be put altogether into just three pages. Except for the opening sequence, where the characters seem to know where they’re actually heading to, for the rest of the film the surrounding ambient takes control of the narration. They pass hours and hours just walking, wandering in various types of landscapes that are parts of the same desert. By putting these scattered atmospheres and geographies together, the filmmaker is giving a hint to his spectator: that desert doesn’t really exist; it is merely a metaphor of a certain state of mind. The characters call each other Gerry, which obviously is not their real names; it’s assumingly an invented one; it’s a game, a code that only the characters know the reason of using it. The filmmaker dosen’t explain or dramatically clarify this very reason for the spectator. 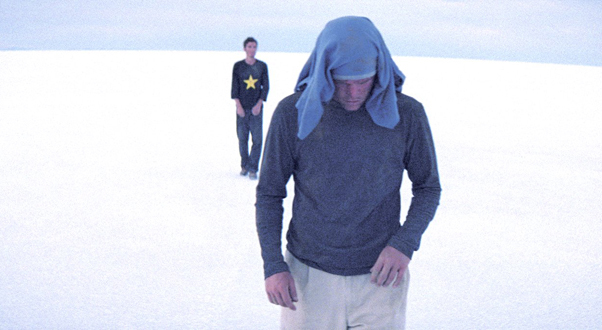 From the very first beginning, Casey Affleck openly shows his tendency to get lost in the desert; he leaves the path on purpose and is reminded more than once by the more conscious character (Matt Damon) that he has to remain on the pre-drawn course. It’s quite obvious what Van Sant is trying to tell us: as soon as Demon chokes Affleck, he catches the sight of the distant road, he intends to live in society, stride on the already taken path while Affleck asks for isolation. He chooses his personal desire over the society morals and intends to draw his own very path. By the end of the film, a passing car picks Damon up and on the way back to the city, Damon realizes that the driver is a father, having his wife on the next seat, beside him; they represent what is accepted and followed, what is assumed normal by society. Gerry (the other Gerry, Affleck) just desired to step off this path. Having the same name seems that Damon has left his own lifeless body out there, lost in the desert. Author Bio: Maryam Raz is a freelance filmmaker and screenwriter. La Mite based on The Gentle Spirit of Dostoyevsky is her most recent work.